Travel back in time to the mysterious Ancient Egypt land on an adventure to discover the hidden golden treasures. Even though there is a wide range of Egypt-themed slots on the market, NextGen Gaming's version is not only intriguing but too, offer high payouts and great features. 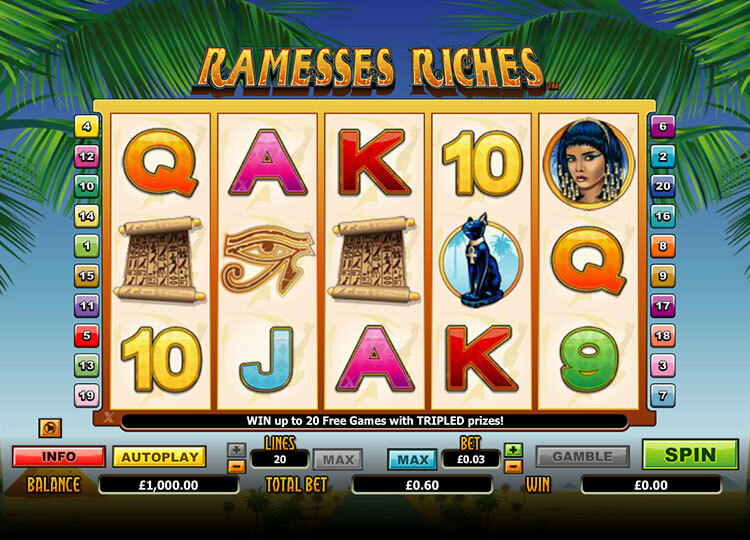 Ramesses Riches comes with a standard layout of five reels, three rows, and 20 adjustable pay lines. Also, there are several special symbols and features including the wild symbol, the multiplier, scatter symbols, free games feature and many more. With medium volatility and theoretical return to player of 95.43% and a betting range of 1p to $20, Ramesses Riches video slot is suitable for players with all budgets. Being a NextGen Gaming product, you expect to come across stunning graphics, excellent sound effects, an appealing theme, like in their previous slot titles. Mobile slots gamers have a reason to smile as this slot is fully optimised with HTML5 technology. If you believe that you have great convincing skills, this slot game is all you need. Ramesses was a great Pharaoh who is believed to have ruled great ancient Egypt for more than 67 years and lived up to 96 years. The developer has used old Egyptian items as symbols in the game including the Ankh cross, Pharaoh Ramesses, the Eye of Horus, and hieroglyphics. You will be amazed by the vibrant background which is adorned by tall palm trees, pyramids, and blue sky that creates a great scene as spin. The background soundtrack is immersive and will set the mood for playing right from the time the game has loaded. Ramasses Riches slot is designed to be played in both autoplay and normal modes. Regardless of choice, you must set the bet to your liking before you click the 'Spin' button. Click on the setting option to access the necessary bet settings. You will find the options for selecting the number of pay lines (1 to 20) and the coin value per line ($0.01 to $10). The Max button will allow you to play all the 20 win lines automatically. All payouts must be made according to the Paytable. Amount wagered on each pay line the multiplies Payline wins. Scatter symbol wins are multiplied by the total money wagered. All scatter wins and added to the payline wins. All the game symbols pay from left to right except for the scatter symbol Ankh which rewards from any side. It's no surprise that Ramesses Pharaoh is the wild symbol in the game. He will substitute all other symbols on the reels, with the exemption of the scatters symbol, to create winning combinations and eventually huge possible wins. Another important role played by the wild symbol is to multiply your gains up to six times! The Ankh represents the scatter symbol, and landing three or more of them anywhere on the reels will trigger the free spins feature. The Ankh is considered to the key to life, and it has a vital place in the Egyptian culture. What's exciting about this slot game is that the free spins come with a 3x multiplier, meaning that if you land a wild in the process of gaming, you get a total multiplier of 6x. Lastly, Ramasses Riches features the favourite Gamble feature which allows you to gamble your winnings after correctly guessing either the colour or the suit of the face-down card. The following are the standard payout based on the game's pay table. The Wild: Ramesses has the power to replace all symbols except the scatter. Landing five Wild symbols pay 5000, four pays 1000, three pays 100, and two pays ten. Scatter symbol: all scatter wins are multiplied by the total amount wagered. Landing five scatter symbols will pay 100, four pays, 15, three pays five, and two pays two. The Lady: landing five symbols of the pictured lady will reward 1000, four rewards 200, three rewards 25, and two rewards three. The Cat symbol: landing five of this symbol pays 250, four pays 100, three pays 20, and two pays three. Eye of Ra: Landing five symbols pays 200, four pays 50, and three pays 15. NextGen Gaming has a good reputation of releasing engaging casino games that can be played across many devices. They have used cutting technology like HTML5 in developing Ramesses Riches online slot to give it not only a beautiful appearance but also the ability to fit small screen devices. One good thing with this slot is that it is available in instant play mode, meaning, you don't have to worry about downloading software to play it. It can be played through standard browsers like Chrome, Firefox, and Safari. 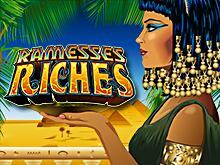 Ramesses Riches is an intriguing casino slot game that will keep you immersed throughout your gaming time. The game is packed with many unique features and symbols to increase your chances of winning huge prizes. While Ramesses Riches can be played on desktops and laptops, it is optimized to be enjoyed on smartphones and tablets too. Thus, you can experience gaming from wherever you want and at your preferred time.